A good, hearty chowder makes a wonderful meal on cold winter evenings. It is also a nice change after the Thanksgiving turkey. I recently prepared this recipe for an event I catered for a Henry Art Gallery board meeting. I served the chowder in individual bowls and garnished them with fresh minced chives (as shown in the photo above), but it’s equally good ladled right from the stove into big bowls for your family. Remove skin and any bones from the fish. Cut into 2-inch pieces. Over medium heat, cook the sliced onions and potatoes in the butter in a 4-quart pot for about 15 minutes. Be careful not to let the onions brown. Add the fish broth and bring the soup to a slow simmer. Simmer the soup for 5 to 10 minutes to finish cooking the potatoes. Check the potatoes by pushing one of the cubes against the inside of the pot with a spoon—it should crush easily. Add the heavy cream and simmer for 1 minute. 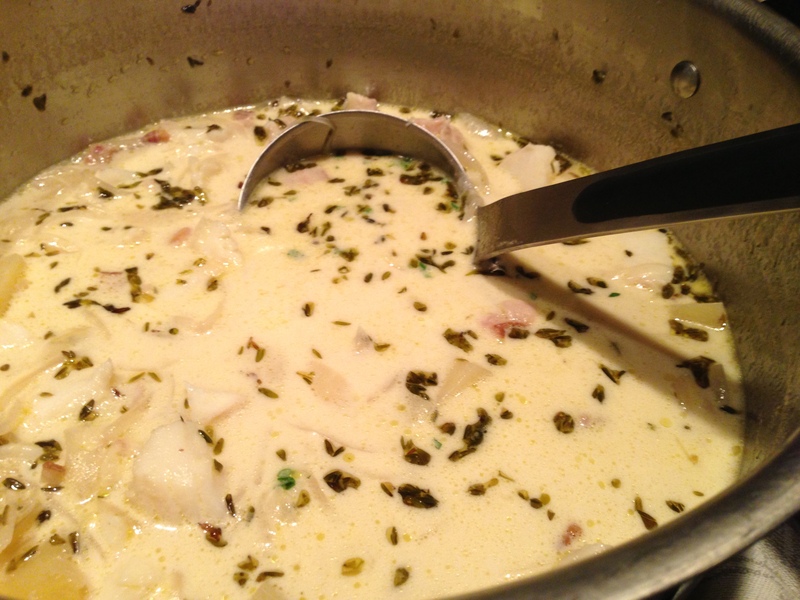 At the last minute, just before serving the chowder, bring it to a simmer and add the cut-up fish fillets. Simmer the soup with the fish for 5 to 10 minutes, about 8 minutes per inch of thickness. Ladle the chowder into hot bowls and decorate each one with a pinch of chopped chives. Recipe from James Peterson’s Splendid Soups. This entry was posted in Gluten-free, Recipes, Seafood, Soups and tagged Gluten-free, Potatoes, Seafood, Shellfish, Soup. Bookmark the permalink. Tina.. 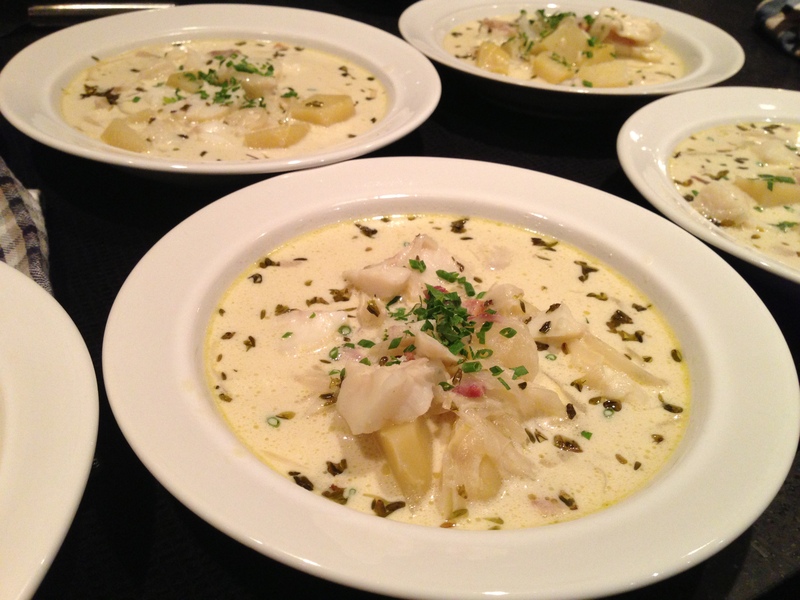 I remember this delicious soup from working an event with you last winter. Where do you get fish broth? and what brand? Good question Laura. You can make fish stock or purchase pre-made. I have found it in the soup isle with the other stocks & broths or they also sell fish stock at Wild Salmon in Fishermans terminal here in Seattle.